Super quick today, the roadmap of how you want to untangle your complicated lens prescription. Note: Don’t go monkey around with lenses if you don’t know exactly what you’re doing. A friendly optometrist can be a great asset. Local laws, be aware of those, and this of course isn’t medical advice (because, your eyes aren’t sick or broken). You are starting out your vision improvement with what’s a complicated mess of a prescription. 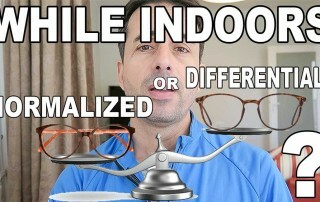 There’s going to be a diopter ratio (your left eye and right eye spherical correction aren’t the same – even if that’s because of a common lens prescription fallacy). There is going to be an astigmatism correction. Fun fact: In most cases you can follow your prescription history back to the beginning, and you started with either no, or very low astigmatism. Look through your entire history, and watch that number climb. What does that tell you about astigmatism? Also, left and right eye astigmatism correction may not be the same. And there might even be a different axis for each eye (axees? axis-es?). That’s a big mess, all of it. A lot of the ‘why’ all this, covered in various parts of the blog, like for example how ocular dominance isn’t meant to be “fixed” with lenses. This, the short visual summary. First thing, understand that the single prescription paradigm (one focal plane change for several actual focal plane needs) is harmful for your long term vision health. You need two corrections, one for close-up, and one for distance. Once you have this sorted successfully, and ideally understand blur horizon and active focus, you’re ready to move on to taking apart some of your prescription complexity. First you don’t want to mess with the complexity. You need to find active focus, you need to get your visual cortex on board with positive stimulus, and successfully translating challenging your eyes into lower diopter dependency. In other words, leave everything the same, just reduce spherical left and right, by the same amount. 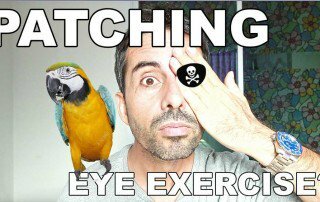 You do this for at least one or two successful (i.e.. back to the same eye chart results as where you started) reductions. Start out any other way, and you just make it hard for yourself. Yes, maybe you don’t need astigmatism for your close-up prescription (you have one of those, right?). But that’s details, things we discuss elsewhere in the blog. Overall though, until you have successful bi-fcoal reductions, everything else should remain untouched. The Donkey Kong level of finesse to vision health doesn’t take into account that one focal plane for distance is a shortsighted (heh) way to treat myopia. People spend most of their day in close-up. 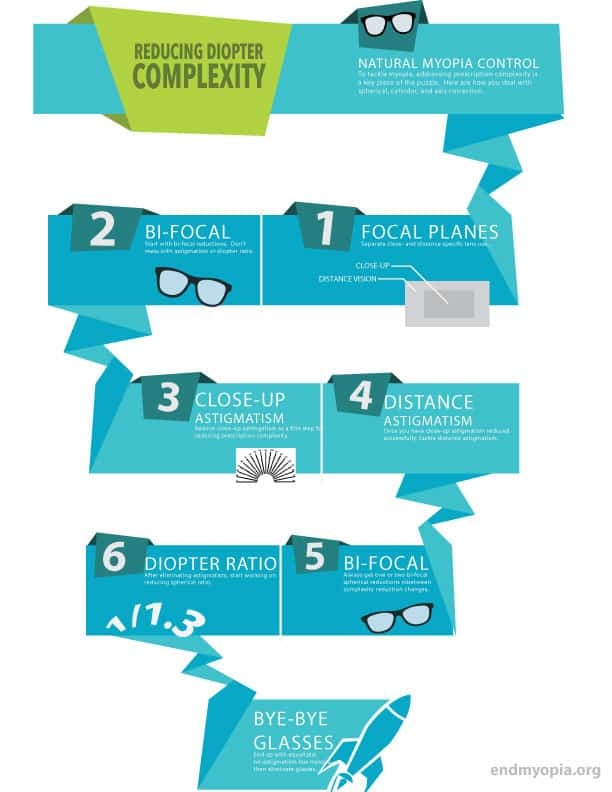 Why are they wearing lenses to correct for distance vision? The single prescription paradigm is going to make sure you’ll need stronger glasses in the future. And having astigmatism correction while in close-up is going to help create an actual need for astigmatism correction. For the most part you don’t need astigmatism correction for close-up, if it’s less than one diopter. And either way, the first bit of reducing prescription complexity, is reducing close-up astigmatism correction. It’s shockingly easy, and equally shocking unnecessary focal plane tweaking, once you go with less (or without, depending on your case) for close-up. You’ll be thinking … so again, why was this in there in the first place? Actually point 2.5 should be, between these kinds of reductions, always make at least one bi-focal, spherical reduction. It’s like a “reset”, it keeps things working smoothly, your visual cortex needs at least one of the “easy” challenges which involves simply reducing the overall focal plane change, without other tweaks. That said, after you reduced close-up astigmatism, and you no longer need it (your close-up blur horizon will tell you whether you’re at this point), then you start reducing distance astigmatism correction. How much, Jake? If you have to ask, you’re getting ahead of yourself. Remember, don’t monkey with stuff you don’t fully understand. Either read enough of the blog, or pay for BackTo20/20. Half-assing this process won’t do you much good. 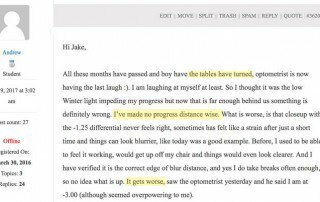 You don’t just eliminate distance astigmatism, like you might (maybe!) with close-up. You just reduce it. Gently. Always get in a nice bi-focal, spherical-only reduction in between these prescription complexity reductions. If you’re high myopia, get in two or three. The more, the better. But once you’re at sub-two diopters, you want a nice, clean, no-astimgatism, equalized prescription. That’s the easiest way to make the jump to no correction, and make that last (and in many ways most challenging) part of getting rid of glasses, successful. Once you’re done with astigmatism, and not before, you can start reducing the diopter ratio (the difference between left and right eye spherical correction). No, you won’t die if you do it another way. 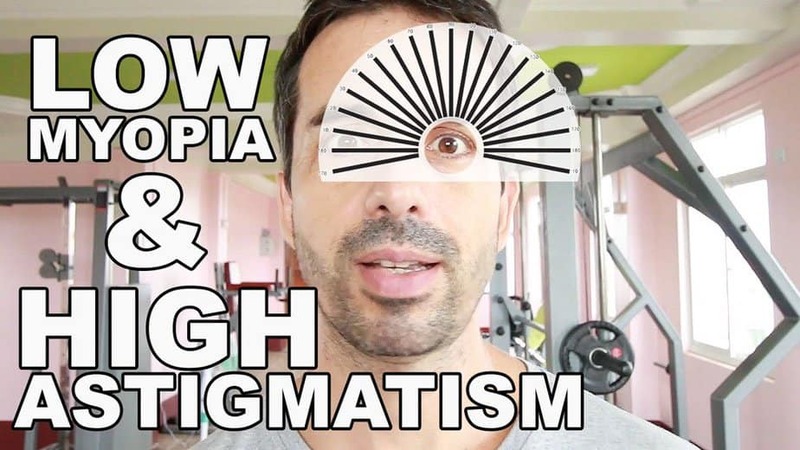 But go find any other heretic method that will give you a diopter a year reduction, consistently and to 20/20, without eye exercises, that has better recommendations (if you do, please do tell .. my ego isn’t too huge for new ideas). 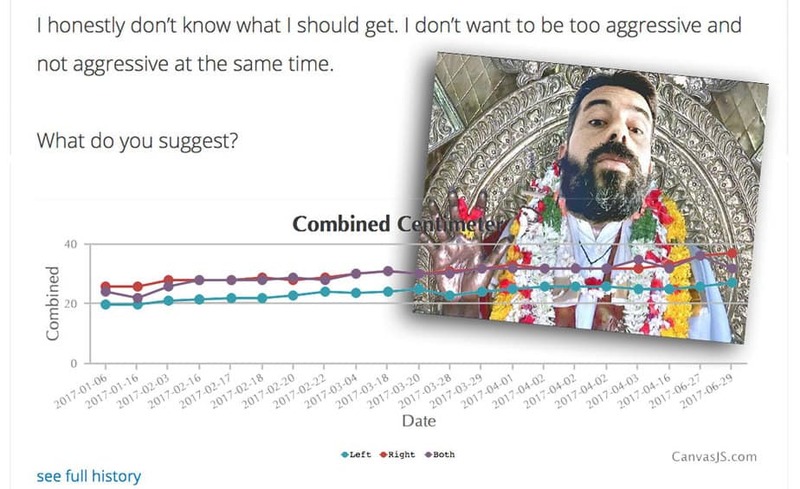 Odds are, considering the trial and error level, that you won’t find a way that’s easier and more effective (remember, what qualifies a method is all the way to 20/20 … “it would have worked if I hadn’t quit”, doesn’t count, darling Bates apologists). And of course, this doesn’t apply equally to everyone. Some people are sensitive to changes in astigmatism correction. Others respond to changes in a way that makes us realize that their whole prescription setup needs tweaking. This, all just a general roadmap. And not medical advice. And not lens sales. Not anything really, other than the usual philosophical musings. Before you say it: Yes, the infographic style summary needs a larger version. First time with Adobe Illustrator, various lessons learned for next time.